As the wars in Iraq and Afghanistan seem to be winding down, for many it brings back memories of the Vietnam war, particularly on one issue: American policy on the rescue and negotiation for American prisoners. Kiss the Boys Goodbye convincingly shows that a legacy of shame remains from America’s ill-fated involvement in Vietnam even though that conflict ended over 35 years ago. Until US government policy on POW/MIAs changes, it remains one of the most crucial issues for any American soldier who fights for home and country, particularly when we are engaged with an enemy who doesn't adhere to the international standards for the treatment of prisoners - or any American hostage - as the graphic video of Daniel Pearl’s decapitation on various Jihad websites bears out. As the authors of Kiss The Boys Goodbye point out, videos of Sergeant Bergdahl's captors graphically illustrate the distinct possibility that Bergdahl could suffer the same fate as Daniel Pearl. In this explosive book, Monika Jensen-Stevenson and William Stevenson provide startling evidence that American troops were left in captivity in Indochina, victims of their government's abuse of secrecy and power. The book not only delves into the world of official obstruction, missing files, censored testimony and the pressures brought to bear on witnesses ready to tell the truth, it reveals the trauma on patriotic families torn apart by a policy that, at first, seemed unbelievable to them. 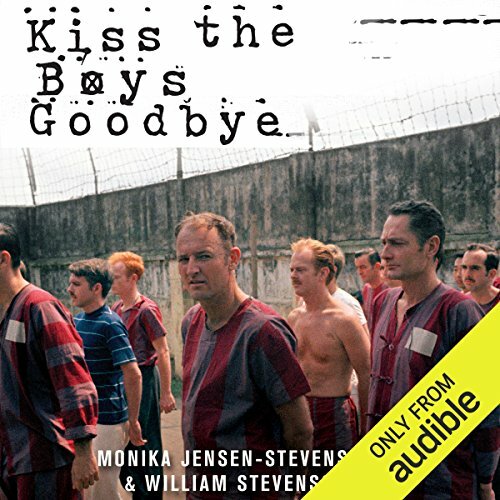 First published in 1990, Kiss the Boys Goodbye has become a classic on the subject. This new edition features an afterword, which fills in the news on the latest verifiable scandal produced by the Senate Select Committee on POWs. The reason it has taken so long to bring out this second edition, which was produced and briefly available in 1999, the publishers leave to the listener’s imagination. ©2014 Monika Jensen-Stevenson and William Stevenson (P)2014 Audible Inc. I'm really torn not giving this a 5-star review because I listened to this start to finish. When I was a kid, POWs were my heroes: My first grade teacher would show us pics of them in the newspaper coming home from Vietnam (so I thought they all came home, right? ), and I just thought they were the greatest. So this book has special meaning to me, special horror. First, I thought it was as well-researched as it could be, given the paranoia, and the cutthroat, you-do-that-we'll-do-this atmosphere. Some scary things happened to all individuals who investigated these situations. Scary? Hell, devastating! It was also interesting who stepped up to the plate, who got "bored" (Ed Bradley), who knuckled under, who got annihilated. Second, I learned A LOT about the war! Yeesh, more than I can hold my head up about. Knew about Cambodia, didn't know Laos was as bad as Cambodia, but Thailand could've been? I'm glad to know. It's horrifying, but it helps to broaden my knowledge of what went on with the hunt for POWs. Third, and I have to smile when I say this, I had no idea Ross Perot, yes Ross Perot, did so much, cared so much for the POWs and really, really tried to bring them home. More than our government did, with far less red tape and BS. No matter what your thinking of him might be, there are over 6,000 men who could've been brought home because of him. This is a brilliant, brilliant, engaging book written by two obviously dedicated as hell people (who were juggling new parenthood) who have a variety of sources and, most notably, Bobby Garwood, possibly the only POW ever to escape Vietnam after so many years (and whose story will make you cry). What makes it 4-stars rather than 5 isn't that there's no "sense of closure." That rather goes without saying. Of course we left POWs there, and left them there to die. Just as POWs were left in Korea, World War II, and no doubt World War I. War is an unbearable horror show that I can't even begin to wrap my mind around. No, what flummoxes me about the book, is that, after all of it, Monica Jensen-Stevenson is in Vietnam, sees a Caucasian man with pale blue eyes, making gun noises with a farm implement, obviously out of his mind. Village woman fling scraps of food at him and scream. Too Painful! Too Sad!!! To Frightening!!!!! This book reveals a painful, sad, and frightening chapter in America's history. Words fail me. I AM MAD AS HELL ! ! ! ! What was one of the most memorable moments of Kiss the Boys Goodbye? THE DUPLICITY AND APATHY OF THE AMERICAN GOVERNMENT PURELY FOR POLITICAL REASONS ! ! THERE WAS NO "GOOD SCENE," EXCEPT FOR THE EFFORTS OF A FEW PATRIOTS WHOSE DILIGENCE EXPOSED MALFEASANCE, NONFEASANCE AND MISFEASANCE OF OUR GOVERNMENT ! ! GOVERNMENT BETRAYAL OF OUR MILITARY ! Having served 62--68 with 4 years combat and having lost many good friends in that senseless politically motivated conflict, I am totally appalled to discover the depths of duplicity, out-right lying and obfuscation. The utter disregard and condemnation of brave Americans in uniform held by our enemies is reprehensible and inexcusable to the Nth degree.This book is NOT for the faint of heart, however, it should be mandatory reading for ALL Americans who blindly trust our representative government to be honest, fair and forthright when questioned. Excellent Book!! Should be required reading. I had no idea what was going on until I read this book. Heartrending, factual. having spent 30 years of active military service, I was deeply moved by this book. I was in the theater of operation on and off from 68- to- 75. this book brought back memories of people in the power positions of our government whom quite simply failed us. this is a great work I just wish I would have read it earlier in my life. Now at the age of 70 I reflect back on many things and still to this day the Vietnam era is most thought about. Would you try another book written by Monica Jensen-Stevenson and William Stevenson or narrated by Bernadette Dunne? Yes, I would try another book by this group, but it has a journalistic style that became wearing after a while and rather repetitive. It wasn't the balanced overview I was expecting, just one side of the issue. However a quick internet search provides the counter argument. I felt let down by the ending which just seemed to reach no resolution. What does Bernadette Dunne bring to the story that you wouldn’t experience if you had only read the book? There are lots of facts, figures and details about the US military and legal structure which the narrator made easy. I wouldn't have finished the written version of this book. Could you see Kiss the Boys Goodbye being made into a movie or a TV series? Who would the stars be? Yes I think I could see this but it would be a highly glamourising version if intended for a mass audience. A thought provoking topic and interesting because much of the follow up was in the eighties which was during my lifetime. What I really wanted was a resolution to the issue of MIA in Vietnam, but I didn't feel this delivered. This is really the story of the researcher and her obsession with the story. I found it was difficult to follow and repetitive because it revealed the stories of individuals as told and then retold to the researcher rather than a chronological timeline. It certainly made me realise how much power the people give to authorities and how it is difficult to ever know truth. I found counter arguments online which completely trashed the assertions in this book and these helped me reach a balanced viewpoint which this book alone did not.